Ohio is one of those states that doesn’t often make the national news. But those who live or vacation here know that it’s far from a boring place to be. With a mix of big cities and small towns, rolling farm fields, and rocky coastlines, and countless museums, theme parks, cultural spots, and even a National Park, the state offers endless year-round activities for people of all ages. 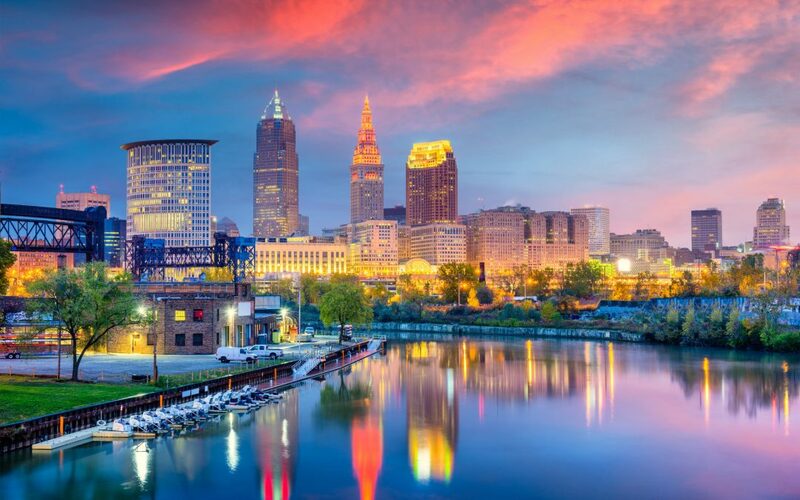 If you’re a first time Ohio home-buyer, it’s time to check out your new state with some of the best things to do in Ohio in the summer! Ohio’s hot summers are perfect for enjoying all of the outdoor activities that the state has to offer. Whether you’re looking for thrills, a relaxing day at the zoo, or even a cool afternoon in a world-class museum, there’s something for every family. Keep reading to learn 5 of the best things to do in Ohio in the summer. If there’s one thing that Ohio is known for, it’s the state’s roller coasters. The so-called “America’s Roller Coast,” Cedar Point, is located in Ohio on the shores of Lake Erie. In fact, climb aboard the Top Thriller Dragster and ride it to the top, and you’ll see that the lake surrounds three sides of the sizeable park. Cedar Point is the second-oldest operating amusement park in the U.S. and is an interesting mix of historic buildings and state-of-the-art rides. The park boasts 72 rides total, of which 17 are coasters. Whether you like wooden coasters, corkscrews, or coasters so fast you’ll be pinned to your seat, this park has a ride for you. Many of the park’s coasters were the fastest, longest, or largest in the world when they opened. Cedar Point also features a large kids area perfect for young families. Nearby you’ll find resorts, campgrounds, putt-putt, restaurants, and more, making it an ideal weekend getaway. If you’ve bought a home in southern Ohio and you’re still busy moving in, a trip to Cedar Point might be a bit far. Luckily, Cedar Fair also operates another park in Ohio, just outside of Cincinnati. Kings Island may have fewer coasters, but it still has its share of thrill rides and family fun, not to mention a very large dedicated water park. If your family loves spending time outdoors, you’ll have plenty of state parks and metro parks to choose from across the state. But what many people don’t realize that Ohio has it’s very own National Park. Located a short distance from Cleveland, Cuyahoga National Park is over 32,000 acres. It’s home to miles of hiking trails, green grassy fields, and around 100 waterfalls. The highest falls, and one of the most popular sites in the park is Brandywine Falls, at 65 feet tall. You can hike along a former stretch of the historic Ohio and Erie Canal, go mountain biking, or even play golf in the park. Interactive displays in the park let you take a look at what settlers in the area experienced on farms during the 19th and early 20th century. Another great family adventure is a trip on the Cuyahoga Valley Scenic Railroad. Also located on Lake Erie, Put-In-Bay is one of the state’s best-kept secrets. You’ll need to take a ferry to this small island, but don’t worry about bringing your car. Most visitors opt to rent golf carts to travel the winding roads of this fun town. With sparkling blue waters, a marina packed with sailboats and pontoons, quaint shops selling swimsuits and flip flops, and restaurants serving up tropical drinks and key lime pie, you’ll think you’re in the Florida Keys. If golf carts aren’t your thing, you can bring or rent bikes or even simply bring your car to explore. There are also plenty of places to rent jet skis and kayaks to see the island from the water. The island features a fully-functional town, with hotels, bed and breakfasts, grocery stores, gas, and more, so you can stay overnight or even for a few days. In Ohio’s capital city you’ll find a zoo and aquarium that rivals others across the nation. The Columbus Zoo and Aquarium is divided into several different lands, each with its own unique theming. Your family will feel as though you’ve been immersed in the places that the animals you see are native of. As the name suggests, the park is home to both a zoo and a small indoor aquarium that’s perfect for escaping the summer heat in the middle of the day. Kids will love the rides sprinkled throughout the park, including a train through the wilderness, a Dinosaur boat ride, a 1914 carousel, and more. In fact, right next to the zoo is an affiliated mini-theme park called Jungle Jack’s Landing. It features 13 rides, a stingray encounter, and an animal encounters area. If you’re looking for something a little more exciting, combine your zoo visit with a trip to their accompanying water park, Zoombezi Bay. If you’re looking for somewhere to escape the summer heat, look no further than Wright-Patterson Air Force Base just outside of Dayton. Here you’ll find the National Museum of the Air Force. With more than 360 planes, helicopters, and other Air Force equipment on display, the museum is both fun and educational. You can read about the history of the U.S. Air Force, climb on planes, and even ride simulators. Nearby the current base is the very location where Orville and Wilbur Wright invented the world’s first aircraft. The museum offers some history of the brothers, while other local exhibits and museums, as well as a dedicated park where the Wrights flew, are also great places to learn about the history of flight. Whether you’re new to the state or simply new to your town, enjoying the best things to do in Ohio this summer is a great way to celebrate your new home! But before you pack up the car for a weekend of fun, make sure that there’s nothing back home that you need to worry about. Schedule your home inspection today so you can rest easy all summer long!